Buying good bread seems harder ... and more expensive ... than it should be. 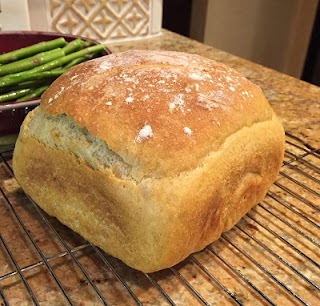 Making your own bread is cheap (the cost for ingredients for this recipe is less than 50 cents!) and good. But for most of us, baking bread, doesn't fit into our modern lifestyles. Using traditional methods, there is the kneading (or cleaning of the stand mixer), then the "being around" for a good 4 or 5 hours for it to rise, punch down, rise again, form, rise again, bake. So through some internet searching and experiments, I have put together the following recipe, which makes 1 loaf. It takes just one bowl and no kneading. 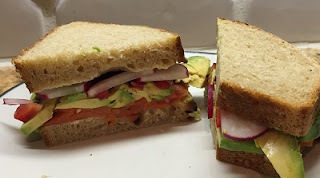 It's mostly whole wheat, although you can use all bread flour or a combination of bread flour and AP flour. You can also use some rye flour for a change of pace. The flavor is nicely developed by the use of some sourdough starter and a long rise in the fridge, so you don't need to be around for 5 hours straight. You do need to be around a couple of hours for the final rise and bake, but that seems manageable, at least for me. As with all yeast products, the rise time will vary with kitchen temperature... if the kitchen is warm, the rise times will be shorter. 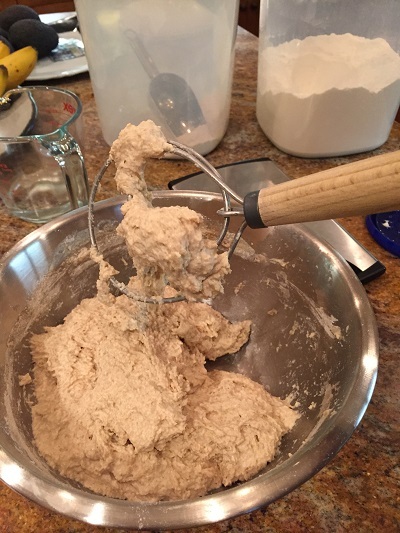 In medium-large bowl, combine sourdough starter, water, yeast, and sugar. Stir with a sturdy spoon (or dough whisk) to mix. Add the flours and salt, and give a very good stir (a minute or so). The dough will be soft and sticky. Let rise at room temperature for about 1 hour, and then put in refrigerator for at least overnight, and up to 5 days. The dough will get more sour with more time. When you are ready to bake, take bowl out of refrigerator. Prepare a 9” x 5” pan by oiling (rub around about a 1 teaspoon or so of olive oil) and flouring. 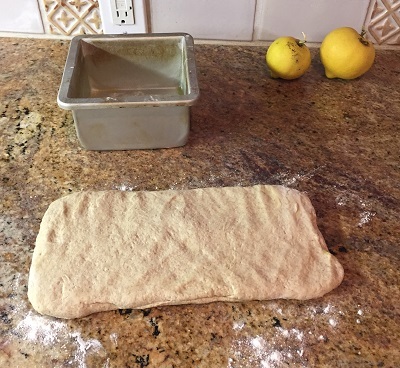 Scrape the dough on to a floured surface (like the kitchen counter), then pat into a rectangle about the size of the bread pan. Handle the dough gently, with as little flour as needed to keep from sticking to hands and counter. Stretch the dough to 3 times the width of the pan (so about 9” x 15”). Fold the dough into thirds, like a letter. 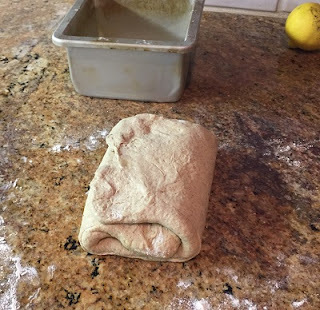 Turn 90 degrees, and stretch dough the long way, to (so about 5” x 27”), and fold into thirds. Turn one more time, and do it again like the first time. When you are done, it should be about 9” x 5”. Pinch the seams, and put into the pan, seam side down. Cover and let rise for 1 hour, or until doubled in bulk. Preheat the oven to 450 oF (this takes a good half hour, so start the oven 30 minutes after the bread is in the pan). Use convection bake if you have it. Score the top of the loaf with a sharp paring knife about ¼” deep, then place the pan in the oven and bake 10 minutes. After 10 minutes, reduce the heat to 350 oF and bake another 40 - 45 minutes. Bread is done when crust is golden, internal temperature should be at least 190 oF (and 200 oF or higher is OK). Unmold by turning out the loaf to a rack. Let cool completely before slicing. Also... 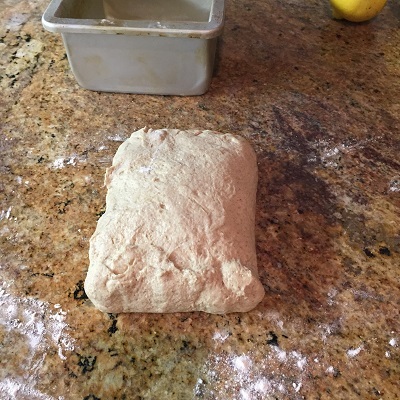 Sometimes I will make a smaller loaf in a 5 x 5 pan, this uses half the dough (and about 5 or 10 minutes less to bake). That is what I am showing in the pictures. More work, but fresh bread twice a week! My starter is nicknamed Blob, and he’s been around for about 8 years now. It's what I use to make pizza dough too. If you want some, just let me know! These instructions assume you have some of Blob to start with. Blob needs to be fed every week or two. I use the following method so that I don’t have to throw any starter out (assuming I am making dough). In between using, he stays in the refrigerator. A couple of notes: You want to use non-chlorinated water… tap water that has been through a filter is OK or bottled water. This is what they call a 50% hydration starter, so you always use the same weight of flour and water. I generally err to the side of too much flour. At least 6 hours before you want to make dough, pull Blob from the refrigerator to warm up (or do the night before). After it’s up to room temperature (2 or 3 hours), or the next morning, add 1.5 ounces of all-purpose flour and 1.5 ounces of water, stir well to combine. Let sit for another 3 hours or so, it should be nice and bubbly and ready to make dough. After you take enough out to make the dough, add another 1 ounce of water and 1 ounce of flour, stir well, and let sit until its bubbly again (3 hours). If you have used more than 5 ounces to make the bread (including what you lose on the spoon), increase the amounts accordingly. It’s ready to go back into the refrigerator. Every so often, transfer Blog to a clean container. If Blob gets a little gray around the gills (like if he has been neglected for a few weeks), feed a couple of times, throwing out the excess. As long as it gets happy and bubbly again, its fine. If it gets pink or other colored, I would start over.